Deckmetal tiles provide excellent acoustic comfort. Its high open surface enhances sound absorption by placing square panels of rock wool in the inside face, with optional black or white fleece. The Sound Absorption Coeffcient or Sabine coefficient (as ) for a given frequency is the ratio between the absorbed energy and the incident energy on a certain surface. This value ranges between 0 and 1. The Average Sound Absorption Coefficient (aw ) is a unique value for all instant coefficients (as ). It also ranges between 0 and 1 and helps us to classify the material acoustically; the closer to 1 the better performance of the absorber suface. 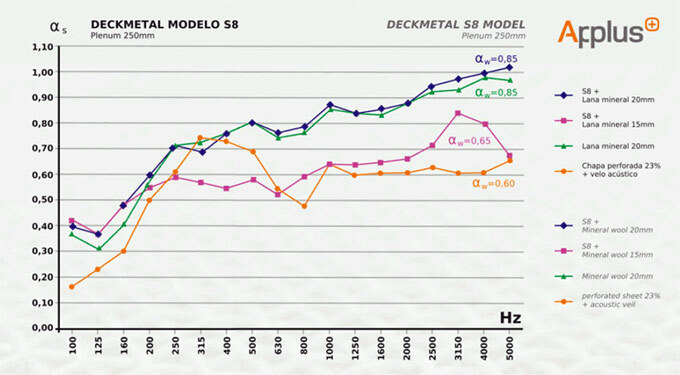 DECKMETAL tiles reach very high values of w depending on the density and thickness of the sound absorber; class of absorption A, B or C can be achieved to match the project specifications. The Sound Absorption measurements were performed in Certified Laborarory Applus, following UNE-EN20354:1994 standard.